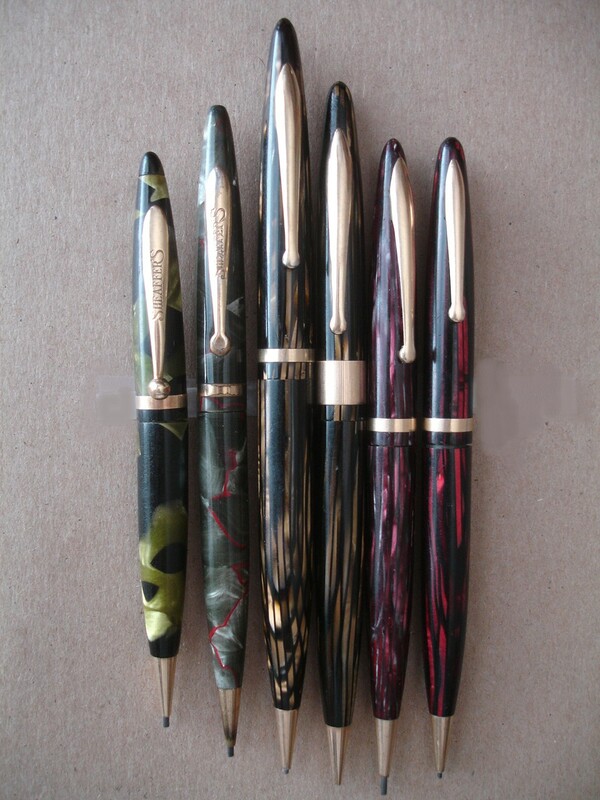 Of all the pencil brands and models I have collected so far, one has become my favorite. I don't think it is because it comes from right here in Iowa, although that's great, of course. I think it's the design, the actual shape, and the way it looks and feels as a writing instrument that makes the Sheaffer Balance rise to the top of my list. The Balance came in four or five sizes, and many wonderful celluloid patterns and colors. 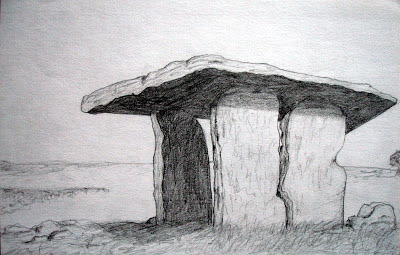 The large Balance is 5 & 5/8 inches. 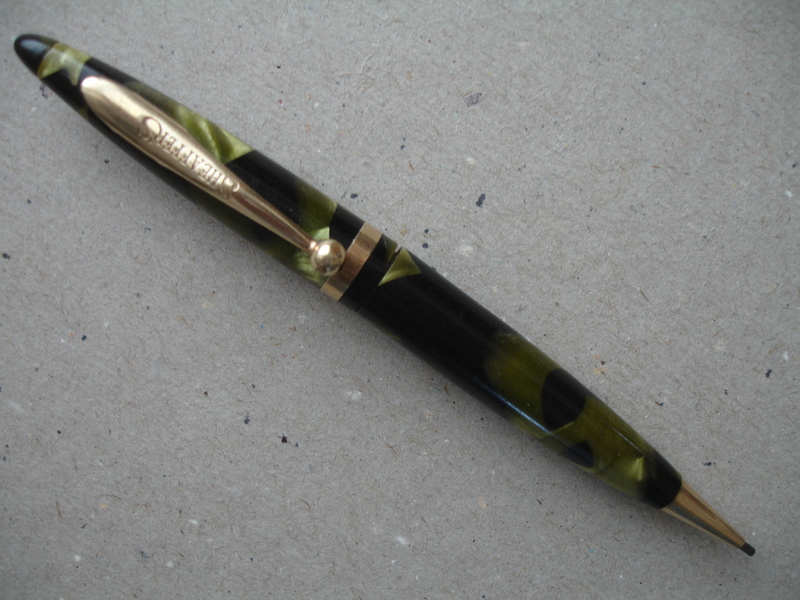 The warm browns and golds in this striated celluloid go well with the gold-colored metal. 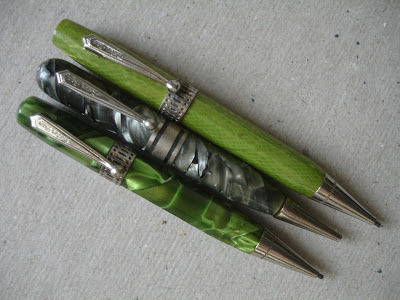 The clip has no marking on this style from the second half of the 1930s, when only striated celluloid was being used, not marbled. The only imprint is the tiny one on the back of the pencil, highlighted in white for the photo below. The original price was $5.00, and it uses 0.9 mm lead. 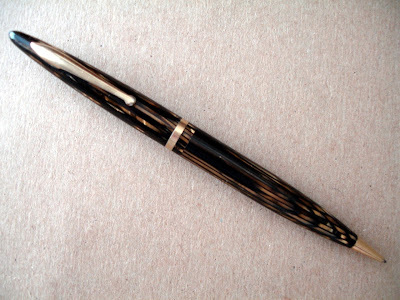 Another example of the golden brown striated celluloid of the same time period is the model below with a wide jeweler's band for engraving one's name or initials. It is 5 & 1/4 inches and uses 0.9 mm lead. Medium size Balances were also available in 4 & 3/4 inches. Below is one in the color of striated celluloid called "rose glow." It uses the older 1.1 mm lead. 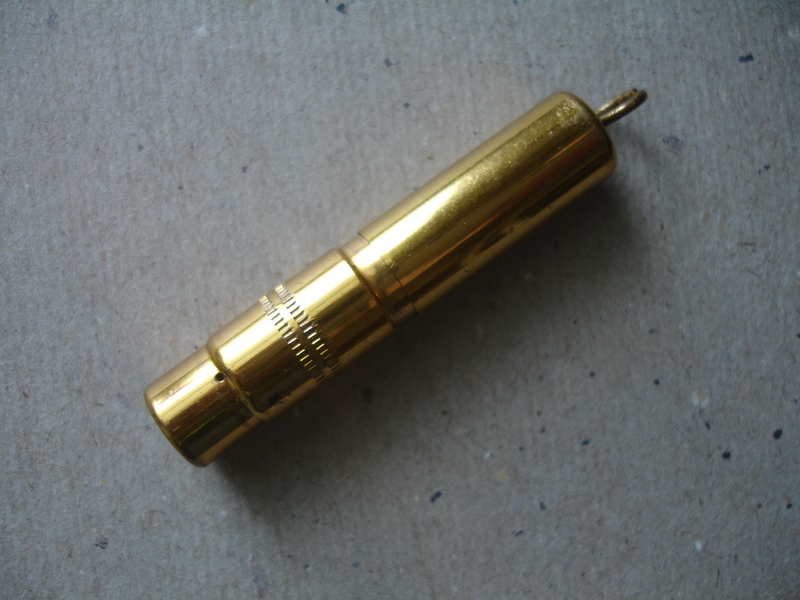 The one below is the same size, but it has a smaller clip and uses 0.9 mm lead. It is red and black. The 4 & 3/4 inch Balance above is from the specific time period of 1934-35. 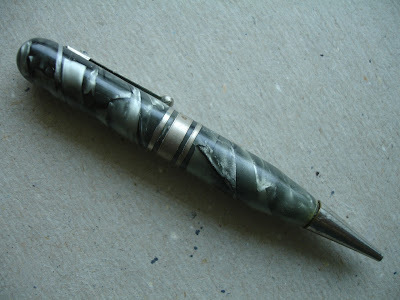 Its grey marble has veins of red, and the clip is marked Sheaffer's. It uses 1.1 mm lead. 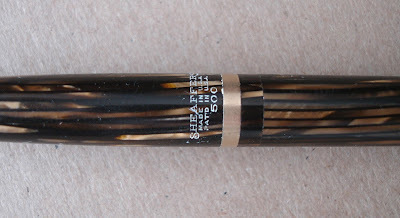 Sheaffer also made a 4 & 1/4 inch Balance, which you would have to call a ladies' pencil, or a pocket pencil. 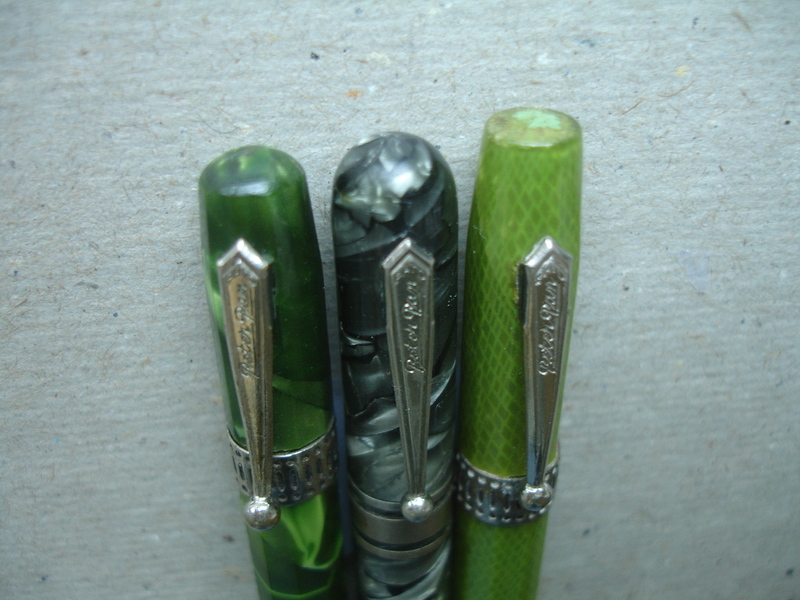 The black and green marble pencil above is the earliest of them all, made from 1929 to 1933. 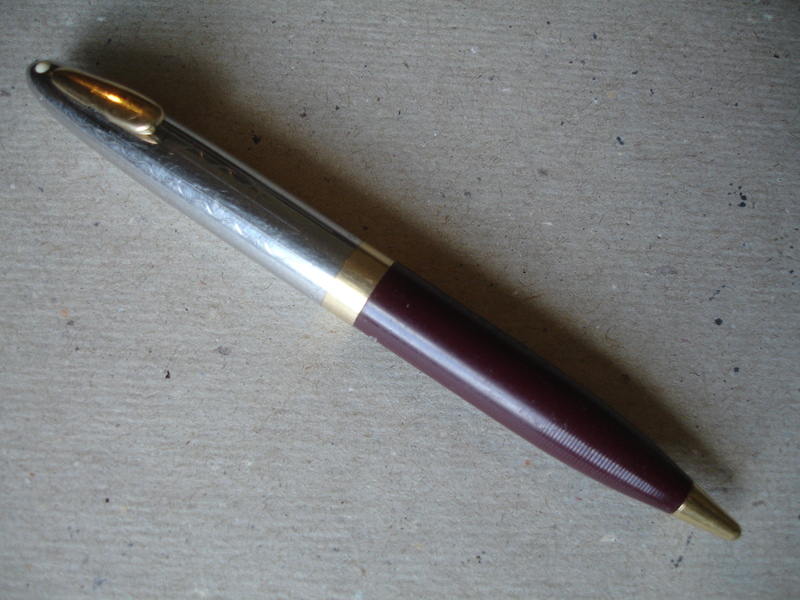 Those from that time period had a ball clip with the Sheaffer name on it, and were fitted with 1.1 mm lead. Below are all the Balances together; because each one has a gold band in the middle, they accompanied Balance pens carrying Sheaffer's lifetime warranty, and were slightly more deluxe. All are still working perfectly after 75+ years. 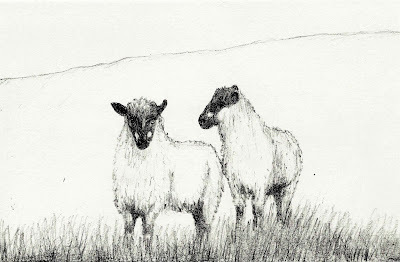 Mechanical pencil mania may make me slightly unhinged, but no one could say I am "un-Balanced." 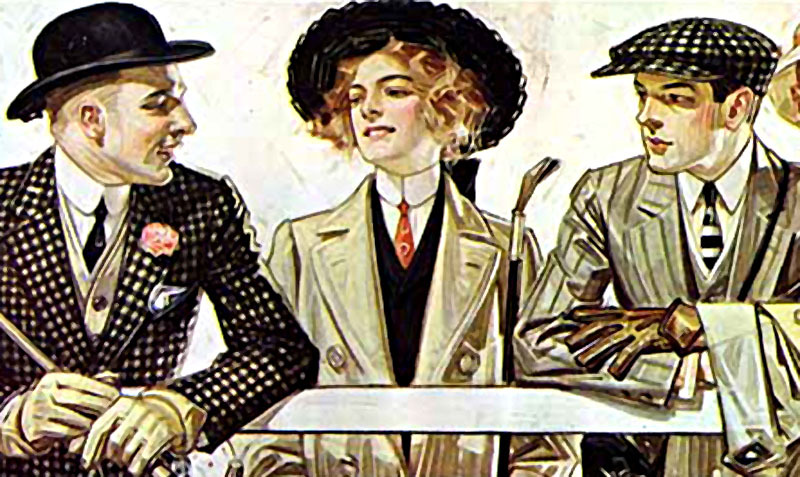 You can easily find a lady's vintage mechanical pencil to match your personal style. If this is you. . .
. . . then you might like something floral. 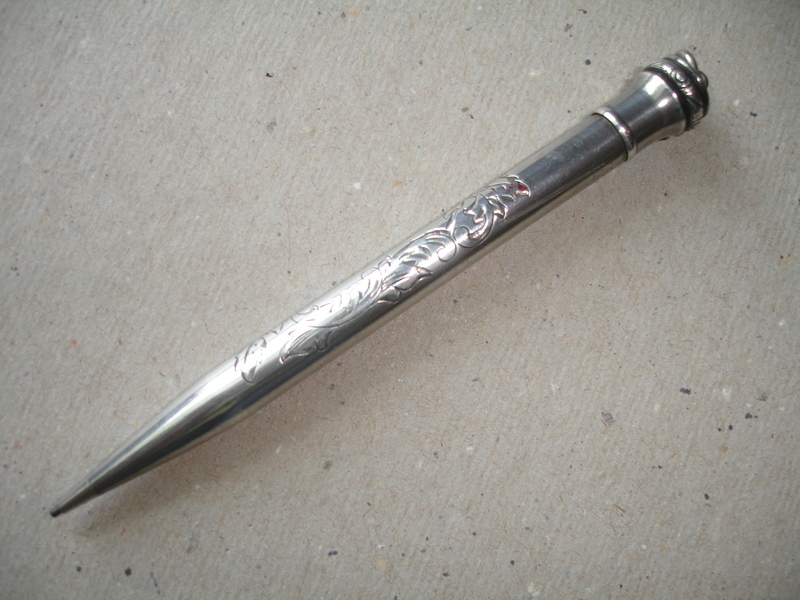 This is a Wahl Eversharp sterling silver ringtop pencil with a floral engraving and your monogram in the center of the flowers. You might wear it on a chain to a dance, and write yourself down for all the waltzes with your current favorite beau (on his dance card, or failing that, on his celluloid shirt cuff) using this little beauty. Your name won't easily be erased with this pencil's 1.1 mm lead. 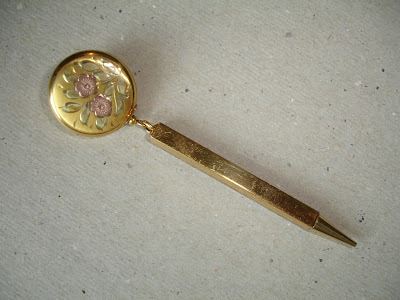 If you prefer gold, and want to have a pencil on a chain, but not around your neck, pin on this floral brooch and when the opportunity comes along to give your telephone number to the right person, just pull down on the pencil and it extends on it's retractable chain. Styled just for you by Ketcham & McDougall of East Orange, New Jersey, the little square nose-drive pencil uses the latest thin lead (0.9mm). Maybe floral is not your style. 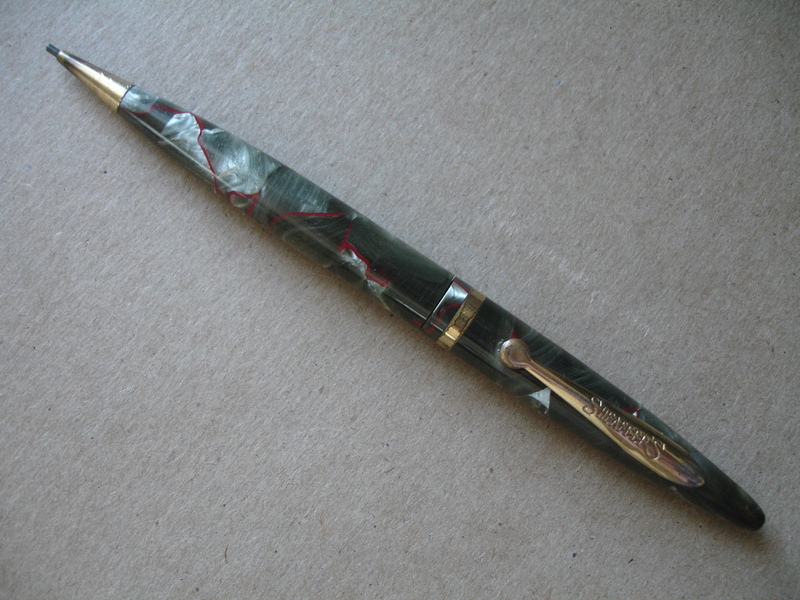 If you prefer something more tailored and sporty, there are pencils for your personal taste, too. 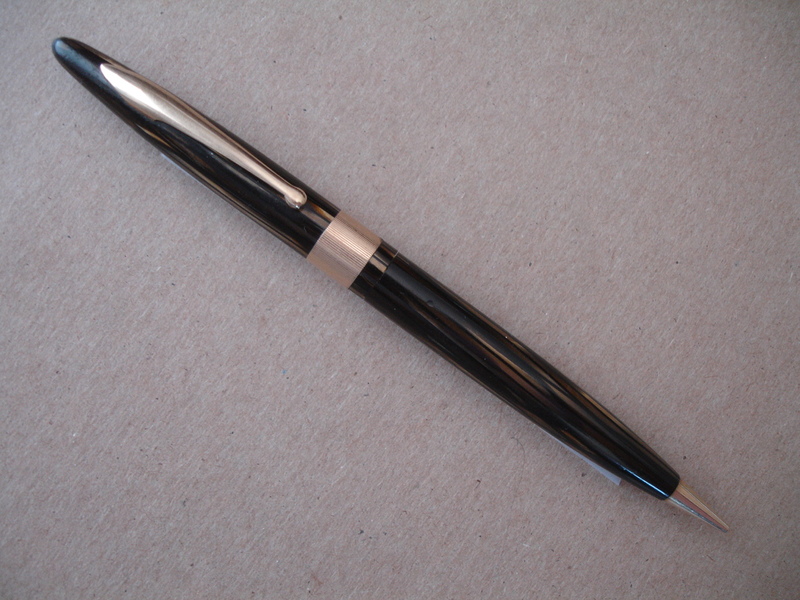 If this is more like you, how about this 4 inch Sheaffer pocket or purse pencil, the "Tuckaway?" This Sentinel model has a two-tone cap with sporty vertical and ripple chasing, a petite clip, and a go-with-everything burgundy lower half. 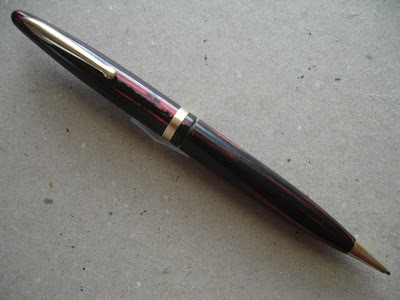 You will write smoothly and finely when you twist out the 0.9 mm lead. 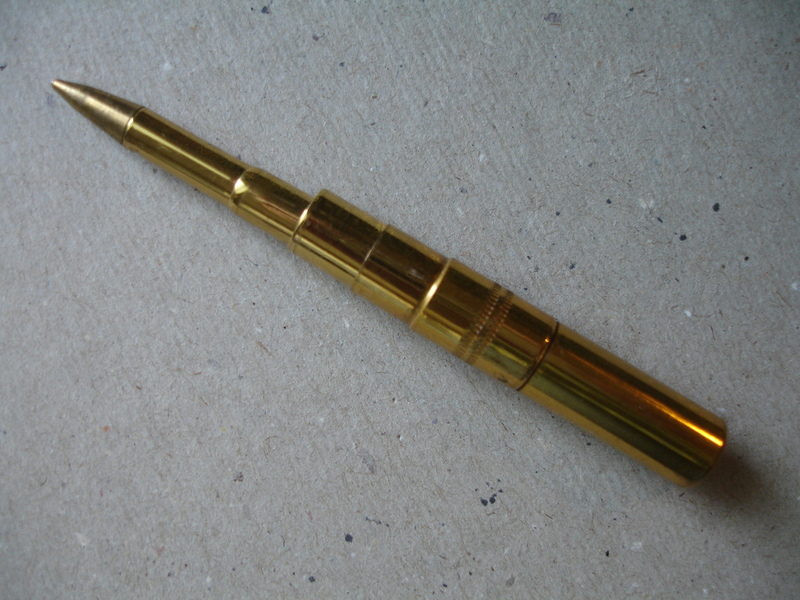 If you are no-nonsense and have not an inch of space to spare, you might like this telescoping pencil by Writescope. Extended, it is 3 inches, but compressed it is only an inch and three quarters. Perfect for the peripatetic life. It would clip to the ripcord of your parachute, even, via the ring on top. 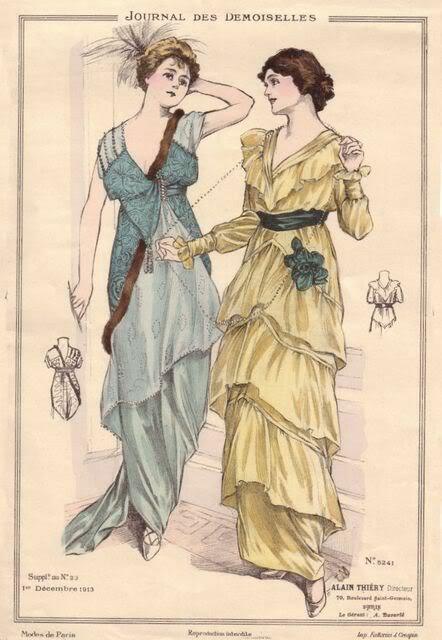 I love a collecting interest that involves accessories! There are a fair few things that go with pencils. It's fun to look for and learn about, for example, pencil boxes, erasers, pencil sharpeners (if you go in for wooden pencils), pencil cases, and pencil holders. The Germans are mad for pencil cases! 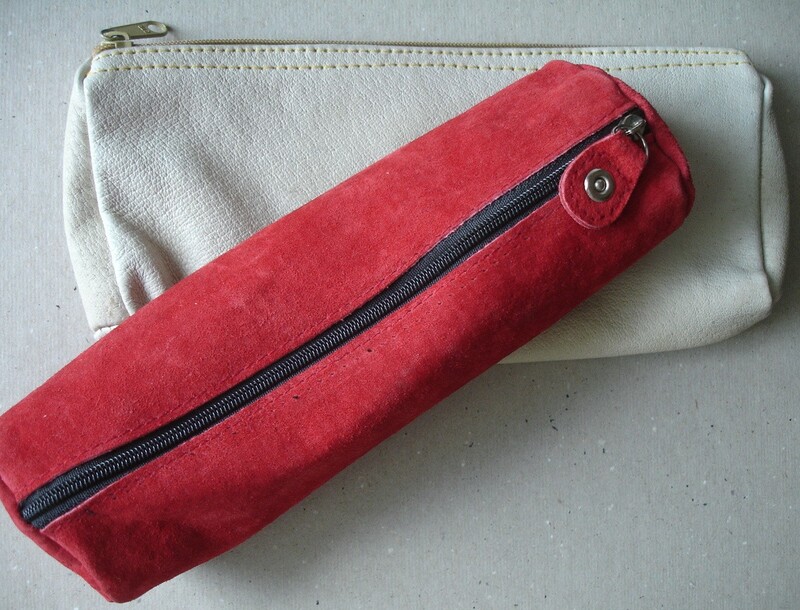 When I lived in Bavaria, I saw pencil cases in every department store, stationery store, and art supply shop. Of course, I had to have a red one. I also bought a larger plain one. They're both made from pigskin, the commodity resulting from all that sausage-eating. Schmeckt gut! 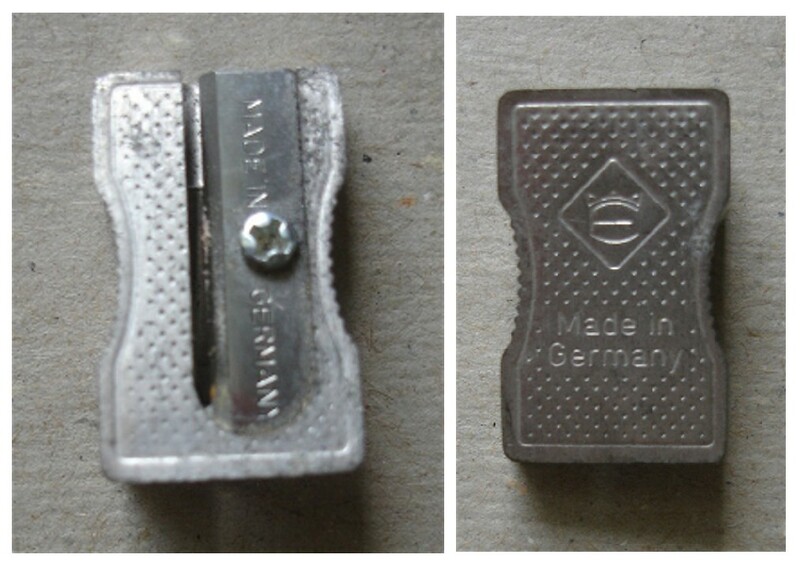 My favorite sharpener is also German-made. 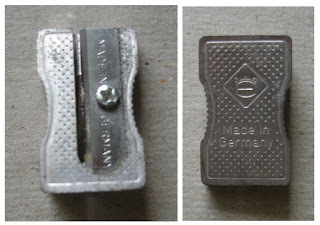 It is small, simple, easy to use, and sharp. I don't even bother to use anything else because this is perfect. I did see a red Bakelite one in the shape of a Scotty dog that was very tempting, though. Maybe this little pencil box is German, too. It is grain-painted pine with a glued-on paper top made to look like inlay work. 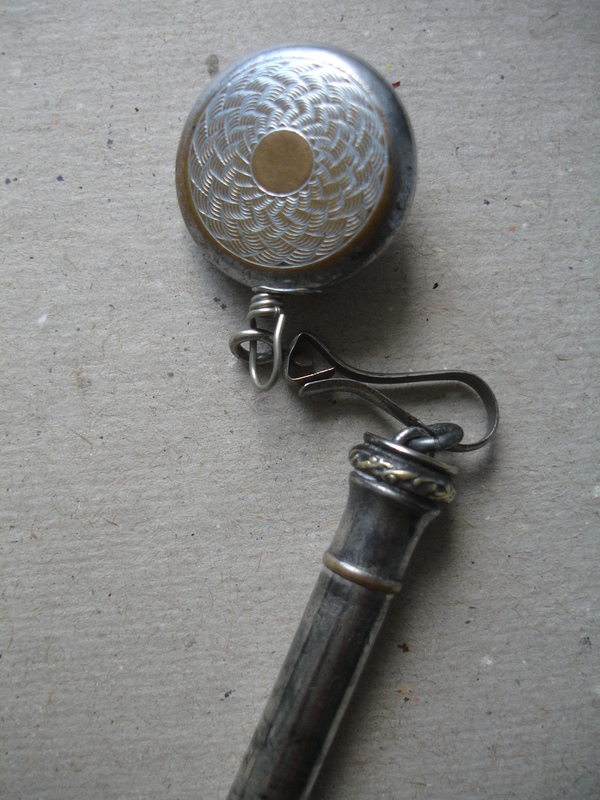 It has a little zinc lock. Goldie owned it and signed it in ink. The bottom is worn paper thin. I like to think of how many years it went to school and was pushed around on desk tops. My erasers are mostly shabby. 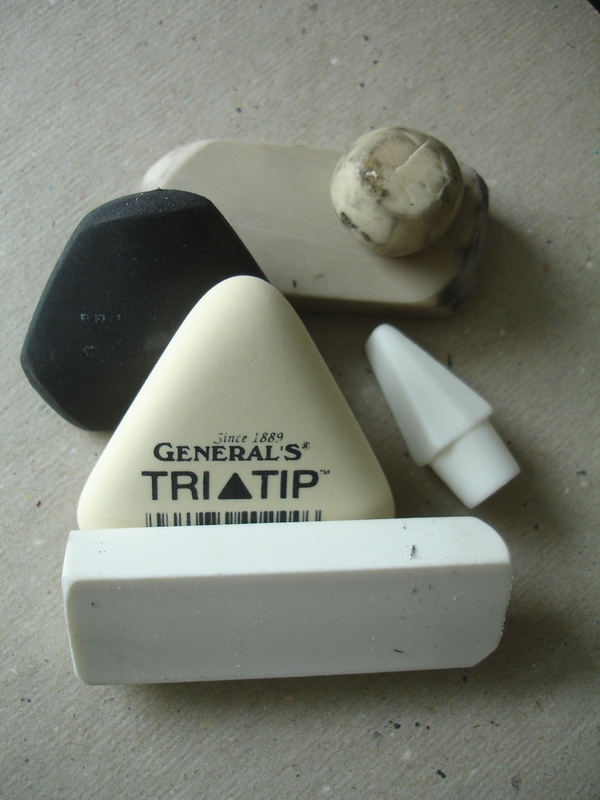 The worn down white ones are Sanford Magic-Rubs, the grey triangle is by Prismacolor, and the large-size cap eraser is Helix from England. 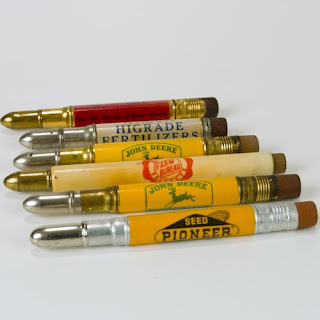 The new triangle is made by the General Pencil Company, once known as the American Pencil Company. I have hopes for it. I also have a new Pentel Clic Eraser. Why couldn't these have been around earlier, so they could have had a beautiful celluloid case and a silver-plated clip? Recently, I purchased a little pin-back retractable-chain pencil holder that I can use with a ring-top pencil. It's just the thing when you have more than one pencil with a ring-top, and you want to show them off. After finding my great aunt's Peter Pan pencil, with her name on it, I got kind of interested in the little guys and have since found two more. Funny thing is, they are all different, and they are all a variation of green. When I was really hoping for red! Great Aunt's is 10-sided green "marble" with the typical Salz pierced band. It's slightly rounded on the top. It is 3 & 1/8 inches, or 3 & 1/4 on tip-toes. 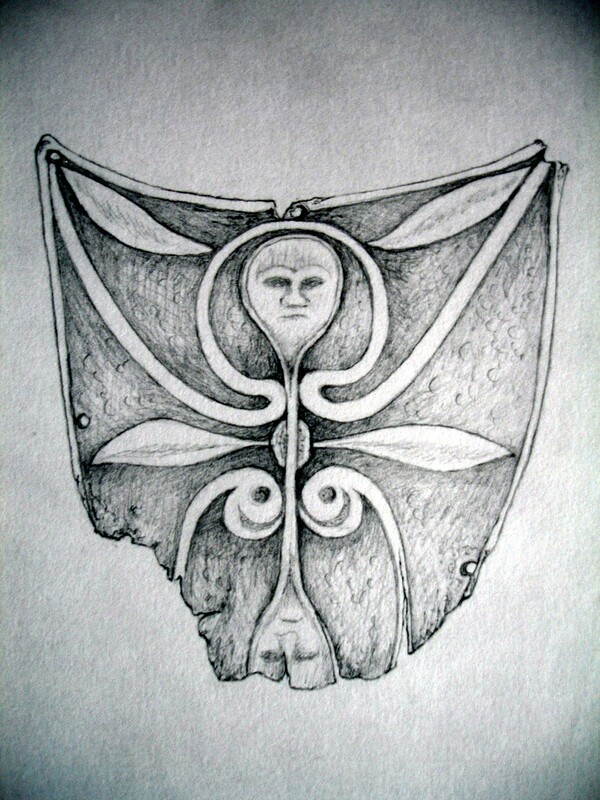 No eraser. It's been in two other blogs--this little guy gets around! 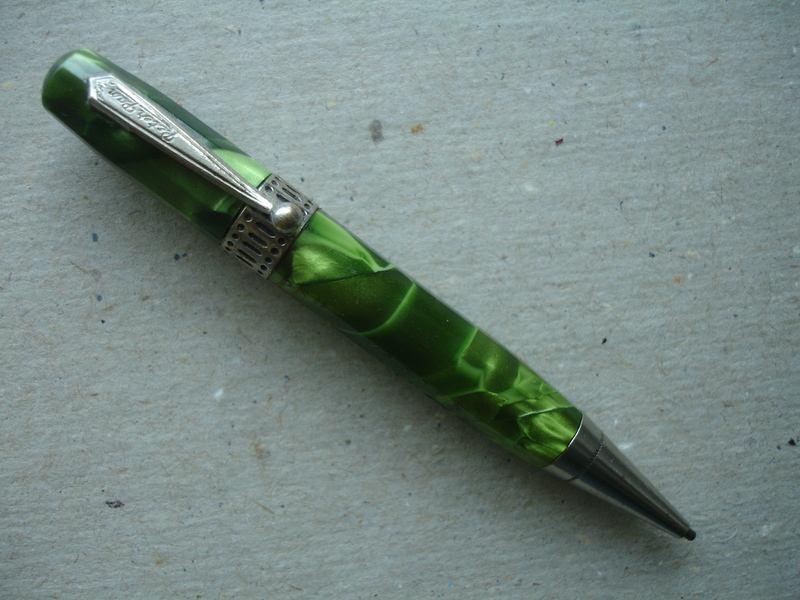 This one is a grey-green "marble," and the celluloid is a strip which has been spiralled around the case. The top is completely rounded. 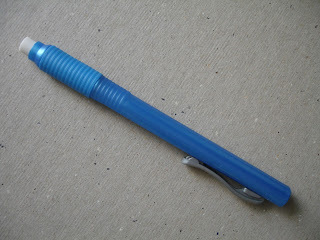 It has a three-part band with no piercing, and a plain nose with no "grip." It is also 3 & 1/4 inches. If you unscrew the top, there is an eraser. 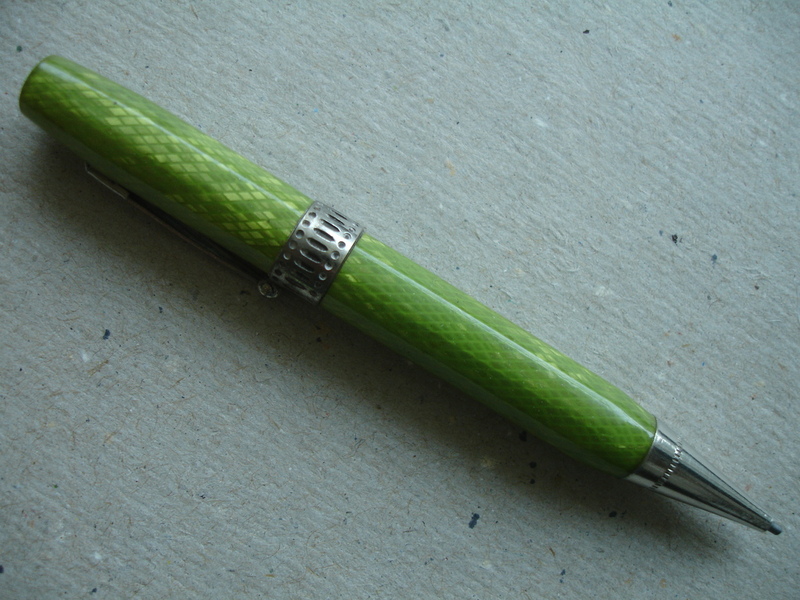 Finally, there is this 10-sided grass-green one, with diamond-patterned celluloid. The top is nearly flat. It has the pierced band, a screw-off top with eraser under it, and measures 3 & 1/2 inches. It also has "grip" on the nose. They all use 1.1 mm lead and have the same clip, reading "Peter Pan" in script, and over the top "PAT'D." I'm as happy with these as Wendy with the Lost Boys and Peter Pan! But I still want a red one. My grandfather had a large, unruly collection of bullet pencils in boxes in the basement workshop. 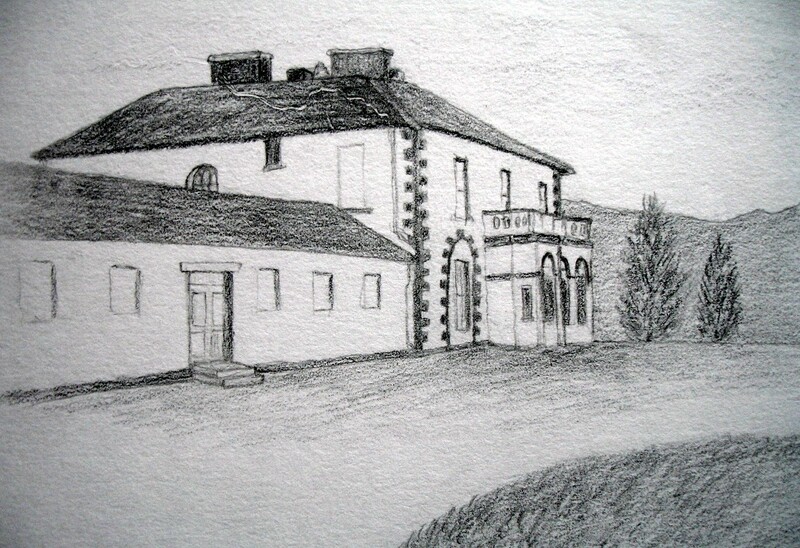 He came from a coal mining family in the Rhondda Valley of South Wales. I think he delighted in getting a free pencil each and every time. He was once a deputy sheriff, actually owned a .45 revolver with a shoulder holster, and had a fondness for anything Western. He always wore a genuine Stetson hat. I'm sure just the name "bullet pencil" had great appeal. Plus he loved to sharpen things. Even his screwdrivers had knife blade edges! Bullet pencils were a staple of life in Iowa homes in my childhood. The ladies who hung out their wash religiously on Monday morning (if possible, an hour earlier than their neighbors, which was a real coup) loved these because the graphite was covered up and didn't make marks on the menfolks' shirt and pants pockets. 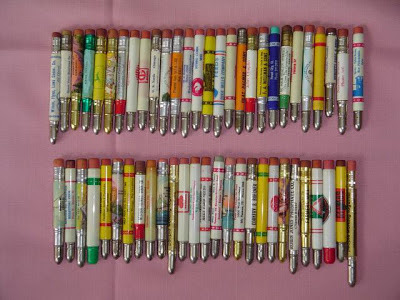 I'd bet money there is a farm outbuilding somewhere in the state that has the biggest display of bullet pencils you could ever hope to see. I saw the key-chain one once. Lots of Iowans have quirky collections, it's not just me! My grandfather's collection was probably tossed out by either my mother or my grandmother or both. Mom was telling me that they had a big clear-out of the basement one time when my grandfather had a broken leg after a car accident. He couldn't get up without help, and he certainly couldn't get down the basement steps. 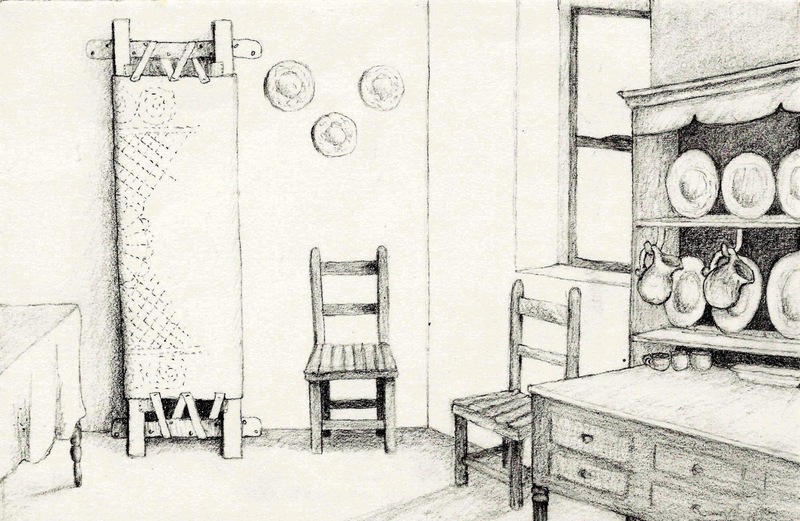 They conspired to clear out and clean up, and he was helpless to stop them, although he banged his crutches on the floor and shouted questions at them. To them the pencils were clutter and junk, but I'd love to have them now. I do have Granddad's tea tin full of marbles that somehow made a miraculous escape. Still, it's good to know that I came by my pencil preoccupation honestly.